You're at a baseball game. The Kiss Cam focuses in on male-female couples in the massive stadium, who kiss to the roars of the crowd. At the end of the sequence of kissing heterosexuals, the camera focuses in on two straight men sitting next to each other. When they realize they're on the kiss cam, they make disgusted faces. Cue the laughter of the crowd. "They put two guys on the 'Kiss Cam' tonight. What hilarity!! (by hilarity I mean offensive homophobia). Enough with this stupid trend." 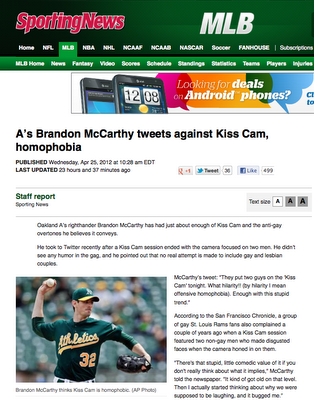 What I really love about Brandon standing up is how he sees the disconnect between the homophobia of the kiss cam moment and the efforts of Major League Baseball players participating in the "It Gets Better" campaign. "If there are gay people who are coming to a game and seeing something like that, you can't assume they're comfortable with it," McCarthy told the San Francisco Chronicle. "If you're even making a small group of people ... feel like outcasts, then you're going against what makes your model successful." Thank you Brandon for speaking up! And for the folks behind those Kiss Cam moments, how about featuring some gay and lesbian couples within the Kiss Cam montage, along with all the other loving couples? ps - thanks to my friend Greg for sharing this with me so I could share it with all of you! pps - you can check out this video report on celebrities caught on the "Kiss Cam" - to see the context of one of these "hilarious" two guys moment. This issue comes up every time we go to a baseball game. Then my son always gets excited that maybe my partner and I will be on the kiss cam. Poor kid is always disappointed.